The Newfoundland and Labrador Historic Trust (“The Trust”) is accompanying the launch of the latest version of its Walk St. John’s app with a real-time history lesson. On Tuesday, July 8, the Trust will live-tweet the events of the Great Fire of 1892 from its account @NLHistoricTrust using #GreatFire1892. 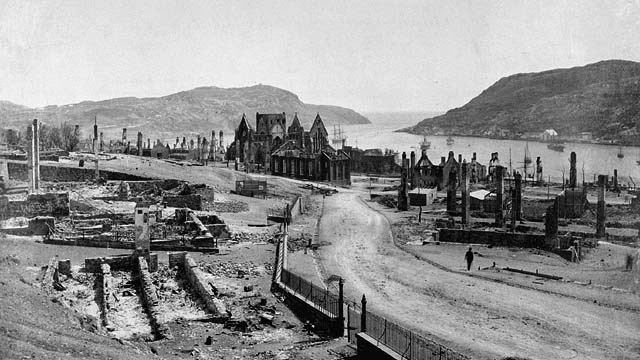 The Walk St. John’s app allows users to experience the alluring streetscapes and heritage architecture of the city, which stand as a testament to the resilience and perseverance of its citizens who rebuilt time and again over the ashes of its past structures. The app, created with the assistance of local developers TPLED Technology Inc., was initially released for iPhone and iPad in 2012. It allows users to select from several round-trip historic walking tours which guide them through the streets of St. John’s. The new version of the app includes a fifth tour tracing the path of the Great Fire of 1892 and is now also available for Android devices. The information used to compile the fifth walking tour was collected by a student researcher employed by the Trust in 2013. A founding member of the Trust, Shane O’Dea, provided a voiceover to highlight points of interest along the Great Fire tour. The Walk St. John’s app is available for free download for iPhone and iPad in the iTunes Store at: http://bit.ly/1n7uwoa and for Android in the Google Play Store at: http://bit.ly/1j8gDGx. The Newfoundland Historic and Labrador Trust, established in 1966, is a membership-driven, non-profit organization dedicated to the preservation of all forms of architecture reflecting the culture and heritage of Newfoundland and Labrador.